Not all users in Noko are allowed to create invoices. If you can't, please ask a leader or supervisor to do it for you. The account owner can also disable the invoicing feature completely. Learn about permissions in Noko. Is it time to convert your hard work into dollar signs and bill your client? 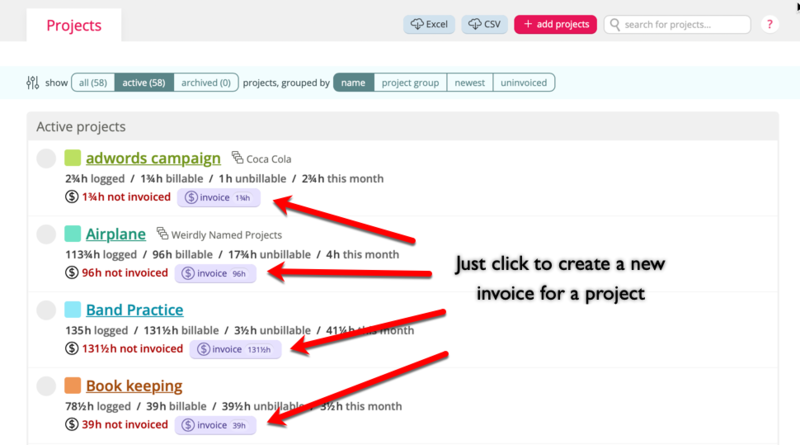 It's super easy and straight-forward to create invoices in Noko. Despite the invoice buttons sporting a $ sign, you can create invoices in any currency and in any language you want. We support taxes (including negative taxes), rebates, expenses, flat fees, different rates for different team members, various types of summaries and attaching a detailed entry-by-entry report to your invoice. You can also enable PayPal payments, and can share your invoice with a client with a few clicks. For those of you who like to print things on dead trees, we support beautifully rendered PDF downloads which print like a charm. Or print directly from your browser, if you prefer. 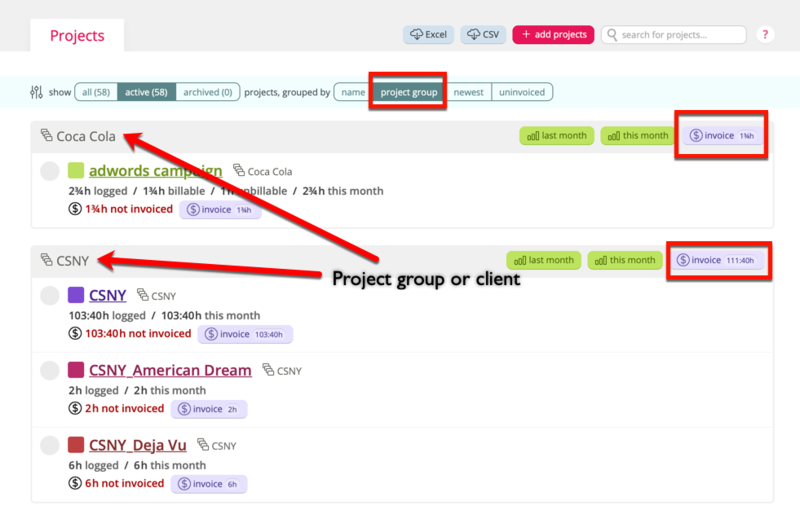 You can create a new invoice from many different places in Noko. 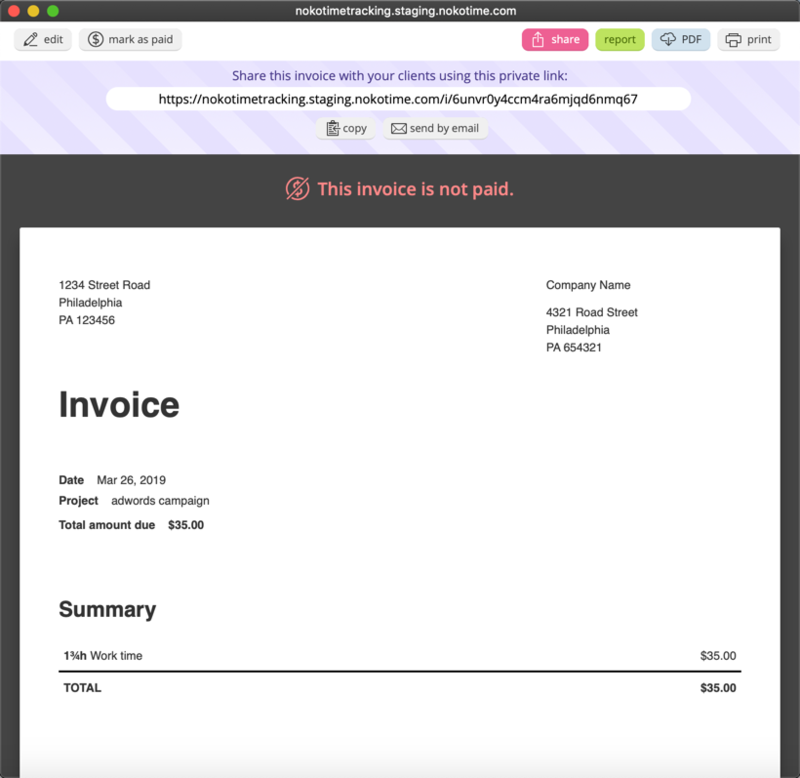 Wherever you see the purple $ new invoice button, you can instantly create an invoice. Directly from your list of projects. Once you click an $ new invoice button, a new window will open allowing you to fill in the details and customize your invoice. We'll copy all labels, descriptions, rates and other settings from the last invoice in the project (or projects) the new invoice is for, or from the latest other invoice in your account. If you're setting up your first invoice, you'll want to configure a few of the basic settings, including date format (we'll use this information to format dates and time), currency and currency symbol. Do you want your client to be able to pay directly with PayPal? Just click the checkbox and fill in your PayPal details. Learn more about Getting paid with PayPal. Then, enter or edit information in any of the light blue fields and edit any labels (looked for the dotted borders), to make the invoice look just like you want it. What you see is what you get when you later generate a PDF of the invoice or print it. Do you want to translate your invoice, add longer descriptions and customize colors and fonts? Perhaps you want to add your logo? Learn more about customizing invoice labels, formatting and custom HTML. 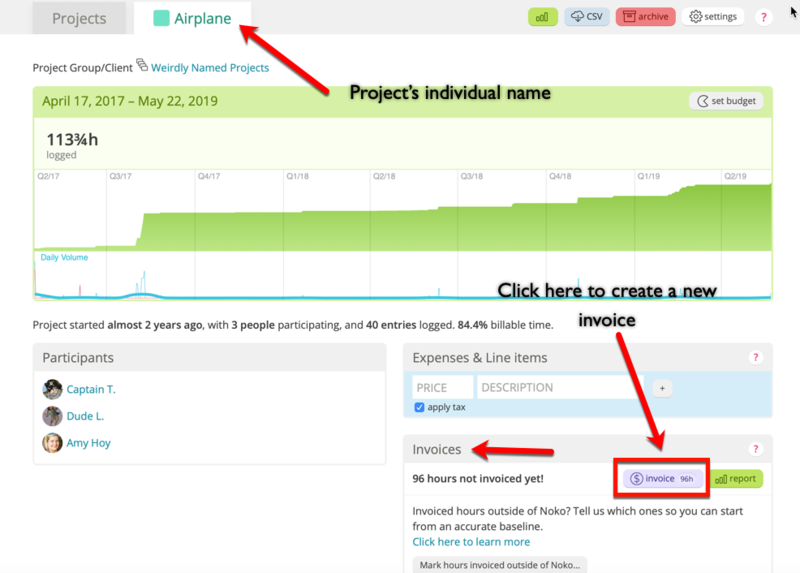 If you're creating an invoice from a project page, you'll see two date tabs on top of the area in the middle of the invoice, All open hours and a date range. Use the date range to narrow down which entries of the project you want to include in your invoice. If you've created the invoice from a report, this option is not available (just narrow down the report to the date range you want instead). In the middle of the invoice, you'll find an area to configure rates, summaries, expenses, taxes and rebates. If you enter a rate into the Hourly Rate field, Noko will automatically calculate all the sums, taxes and totals while you type. Or you can specify a flat rate (or fixed price) for the invoice. Noko will still add expenses and taxes on top of your flat rate. Learn how to set custom rates for your team members. Make use of summaries and full reports. Add taxes to your invoice. Make sure all your expenses get billed. Once you're done, click the Save & Preview button on the top right to save your invoice! 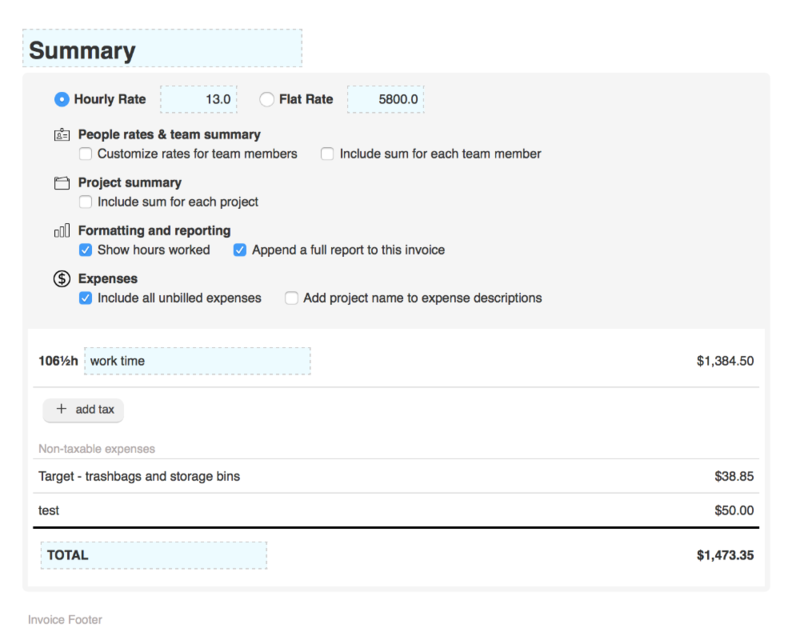 Your invoice will now show up when you click on Invoices in the green navigation sidebar. 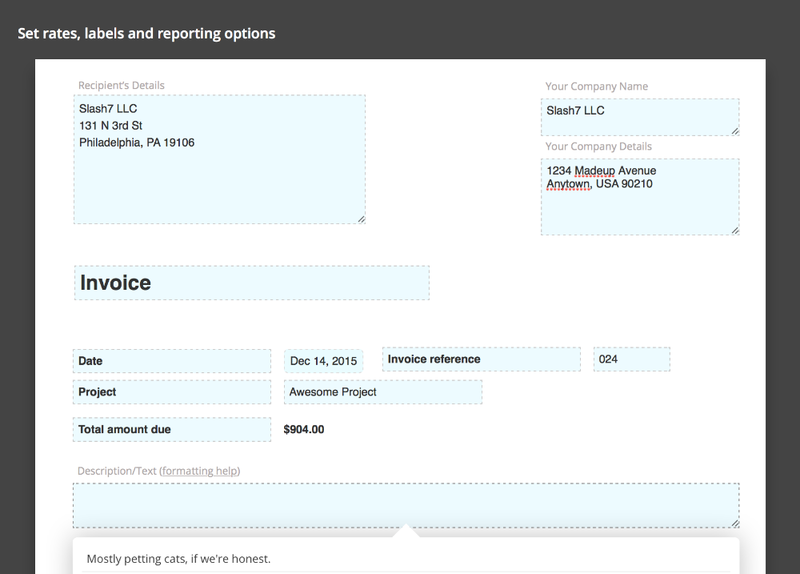 When viewing an invoice, you have the option to share it with your client. Just copy the private link Noko shows you into an email to your client, and your client can view and print your invoice. Even better, if PayPal payments are active, they can pay you right away. When your client pays you (and you're not using the automated PayPal feature), it's time to set the invoice to paid. Learn more about invoice statuses and how to set your invoice to paid. Tip: If you are ever curious as to what entries make up an invoice, just view the invoice and click Show report to see a report of the exact entries that are part of the invoice.